Developped a new jazz trombone for the Courtois Company, the Xtreme AC 430T model. After studying the classical piano, the guitar and harmony, Phil Abraham was seduced by jazz and the trombone, on which he is self-taught. His stylistic evolution is parallel to the history of jazz, and even if he is a modern soloist today, he has worked with a wide variety of great musicians. Phil has taken part in more than fifty albums, ten with his own group, with which he won many prizes. He has often been invited in big bands as a soloist. He took part in many recordings and concerts of the big band of the Belgian Radio (BRT). Phil Abraham also devotes his career to teaching, training courses and master-classes. He was a teacher of vocal improvisation in Antwerp and Brussels. He is now a jazz and trombone teacher at the Brussels Royal Conservatory and at the National Conservatory in Douai (France). Carmen Accordino, a Miami lawyer who also worked as a jazz trombonist, died on Oct. 18 2003 from complications of pneumonia. He was 74. Accordino received a trombone as a gift from his parents; he mastered the instrument by the time he was 10. Dr. Achilles holds a Bachelor of Music degree from Northwestern University, a Master of Music degree from Indiana University, and a Doctor of Musical Arts degree from the University of North Carolina at Greensboro, where he received the prestigious Chuck Hayes fellowship. B.M., New England Conservatory; M.M., Juilliard; studies with Norman Bolter, Joseph Alessi. Frequent orchestral performances with Boston Symphony (second trombone 1996-97 and 1998-99 seasons) and Pops (second trombone), Rhode Island Philharmonic (principal), Utah Symphony (assistant principal 2000-01). He was educated in the Trenton NJ school system where he met my musical mentor Tommy Gryce, brother of the world-renowned jazz aficionado GiGi Gryce. Jeannine studied at the conservatory of music at the university of the pacific under Robert Halseth (trombone and conducting) Steve Pedicarius, Mark Lawrence and Heather Buchman. She has played with San Diego Symphony, San francisco Symphony, Sacramento Symphony/Opera and Stockton Symphony. Currently working in the San Diego/Riverside/Inland Empire area as a jazz/orchestral trombonist. She has been fortunate enough to play and study also under BIll Yeager, Bill Watrous, Ashley Alexander, Mike Vax (jazz Studies), George Roberts, Herbie Mann, Bunky Green, Jon Faddis, and Billy Hawkins. Currently the Jazz Chair trombonist in the US Army's top touring big band from DC--the Jazz Ambassadors, Jeff has many free samples of his improvising in numerous styles available for free D/L on SlideAdams.com. Also to found there, the complete recording of Rochut/Bordogni Melodius Etudes Vol. #1 (all 60 etudes) available through a sales portal on his site (soon to be on iTunes, eMusic & Rhapsody too). Also available is his harmonized recording of Raph: Dance Band Reading & Interpretation. Eliezer Aharoni, born in 1945, grew up in Jerusalem. He has studied trombone with Ray Parnes, principal trombonist of the Israel Philharmonic Orchestra; and served in the Israel Defense Army Band as bass trombonist. In 1966 he joined the Jerusalem Symphony Orchestra as bass trombonist. In 1969, Mr. Aharoni was a recipient of a study scholarship from the America-Israel cultural foundation. He subsequently studied with Mr. Ernest Lyon at the University of Louisville, Kentucky, and with Edward Kleinhammer of the Chicago Symphony Orchestra. 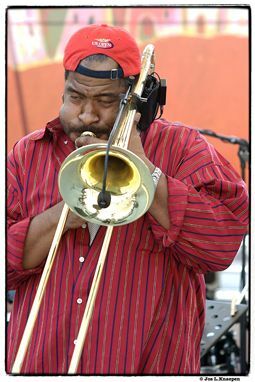 Jeff Albert is an in demand trombonist and arranger in the New Orleans area. He performs in a wide variety of idioms, from jazz to reggae, latin, and R&B. He co-leads the contemporary jazz quintet Albert-Ankrum Project, and is also a member if the eclectic and innovative Naked Orchestra, and The Boogie Men. Lisa Albrecht joined the San Antonio Symphony as Assistant Principal Trombonist in 1986. She has performed with orchestras across the US, Europe, and Asia, including the Honolulu Symphony, Rochester Philharmonic, St. Louis Orchestra and the London Sinfonietta. Originally from the Napa Valley, Tim Albright moved to New York in 1999 where he enjoys a diverse freelance career on the trombone. He graduated from the Eastman School of Music in 1998 with degrees in classical and jazz performance. Dan Aldag is currently a Visiting Assistant Professor of Music at Humboldt State University, where he teaches low brass, leads two jazz bands and teaches courses in jazz and popular music. As a performer, Dr. Aldag has extensive experience in the jazz and classical realms. Randy Aldcroft was born in Toronto Canada and studied the trombone with Harry Hawe, the first trombone with the Toronto Symphony. After moving to Los Angeles with his family he studied arranging and composition in high school, forming a 'big band' with great LA musicians like Joe Mainey, Conte Condoli. Joseph Alessi was appointed Principal Trombone of the New York Philharmonic in the spring of 1985. Mr. Alessi began musical studies in his native California with his father, Joseph Alessi, Sr. As a high school student in San Rafael, California, he was a soloist with the San Francisco Symphony. Principal Trombonist, Finnish Radio Symphony Orchestra. As the trombonist and arranger for the Church of the Apostles Eric's playing and arrangements are heard in the Church's weekly broadcast in 192 coun tries around the world as well as the weekly Internet Broadcast. Also, an active freelancer in Atlanta his playing can be heard on many Turner Broadcasting. Formerly from Connecticut, Mr. Allard studied voicing and brething control fro m the late sax master, Joe Allard (a distant relative). His music teachers included, Mark Weaver (USCG), Fred "Moe" Snyder, and Eddie Bert. He studied music theory under Michael Linton and jazz theory under Bill Finegan. Rex Allen was born in Pittsburgh, PA and grew up in the San Francisco Bay Area. His father Charles was an amateur drummer and follower of early big bands in New York City. Brian Allen attended the Texas Tech University School of Music, earning a Masters in Composition and a Bachelors in Trombone Performance, studying with Don Lucas. He has also studied at Banff and the University of North Texas. He has performed with Dave Ballou, Mark Dresser, Ellery Eskelin. Jonathan Allen began his musical studies at the University of Northern Colorado with Edwin Buddy Baker in the Fall of 1997. He continued his education at the same institution with Dr. Nat Wickham. He received his Bachelor of Music in Trombone Performance in 2004. Modeste Eugene Emile Alloo (1884-1975 ) Belgian by birth, American citizen since 1918 Graduated from The Royal Conservatory of Music in Brussels and The Verviers Conservatory with highest honors in 1906. Studied counterpoint and fugue in Paris with Andre Gedalge, Professor at the Paris Conservatory. John Allred knew at a young age that he wanted to carry on the jazz legacy of his grandfather and father. Born in Rock Island, Illinois and growing up in a musical environment, John developed a deep appreciation for jazz. Willie Alvarez was born on July 24, 1966 in Elmhurst New York. He began playing the trombone at the age of 11. Since then he has performed, traveled and recorded with some of the worlds greatest latin musical legends. Dirk Amrein, born in Degerfelden (Germany), poet and thinker of the group ISBS, multi-instrumentalist, wine-connoisseur, brewer, craftsperson and sport-freak. Robynn M. Amy is a freelance artist in the Boston area who specializes on both the tenor and bass trombones. She has performed in big bands and orchestras all over the United States, including the DIVA Jazz Orchestra, Ryles Jazz Orchestra, the Kendrick Oliver New Life Jazz Orchestra, the John Allmark Jazz. Born in Málaga.He started to play at 10 years old. He studied with Francisco Martinez in Malaga conservatorie wining Honorific prizes and with Dominique Rombaut,Indalecio Bonet, Francisco Blay, Baltasar Perelló, Csaba Toth, Ricardo Casero and Raul Garcia among others. Trombonista, Colombia Graduado Universidad Nacional de Colombia, actualmente profesor de Trombon Universidad del Cauca(popayan), director ensamble de trombones, director conjunto de metales y coordinador del Area de Vientos. b. Oct. 5, 1957, New York, NY Clifton Anderson, the nephew of Sonny Rollins and a longtime member of his band, has long been awkward position of sharing the stage with his uncle, standing motionless while Rollins takes extended solos. 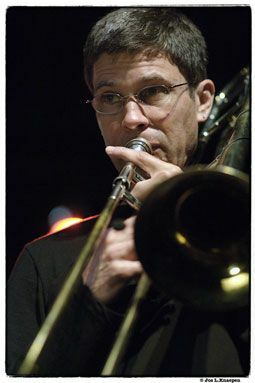 In his 46 year career, trombonist Miles Anderson has performed in a variety of musical genres working with leaders as diverse as John Williams and John Cage, and Pierre Boulez and Les Brown.He has performed as a soloist in the United States, Mexico, Europe, Australia and Japan. Pete Anderson is probably the most in-demand jazz trombonist in Central Virginia. He has been a musician for twenty-five years, having played professionally for the last fifteen. These many years of experience have left him with numerous influences and the knowledge of many diverse styles of music. It has been, however, the music of Duke Ellington that has had the greatest impact on Mr. Anderson's personal musical styling. Timothy Anderson is an adjunct member of the music faculty at the University of Dayton, teaching trombone and low brass, and a member of the Faculty Brass Trio. After receiving a Bachelor of Music degree from the University of South Carolina (Columbia, SC). Scott Anderson is Professor of Trombone at the University of Nebraska. He is the head of the Brass and Percussion Area and trombonist in the University of Nebraska Brass Quintet. Dr. Anderson has taught at St. Cloud State University, the University of Minnesota, the MacPhail School of Music, and Dana College. He earned degrees from the University of Minnesota (DMA 1995), Northwestern University (MM 1987) and Iowa State University (BM 1985). Named five straight years as best trombonist in the Down Beat Critics Poll and declared "the most exciting slide brass player of his generation" by the Penguin Guide to Jazz on CD, Anderson has shown remarkable range. He has led or co-led a daunting assortment of tradition-minded and experimental groups. Michael Anderson (trombone) is an undergraduate music composition major at the University of Illinois , where he has studied with Stephen Taylor, Zack Browning, Rick Taube, and Keeril Makan. After four years of studying with Jan Andersson he got a job as trombone player with The Stockholm Symphonic Wind Orchestra. There he played till the orchestras bitter end in 1996. Since then he has been freelancing, playing mostly with The Swedish Radio Orchestra, The Swedish Chamber Orchestra, in theaters (The Sound of Music, Christina From Duvemåla, Benny Andersson of Abba's latest success, etc. ), on TV and radio, and also on various recordings. Andre started his long career performing with and writing for Charlie Spivak, Sauter-Finnegan, and Woody Herman. He composed his Nutcracker and arranged The Preacher for the Kai Winding septet in the mid-1950's.  Wynton Marsalis, Director Jazz at Lincoln Center Prominent in his hometown of New Orleans. Freelance trombonist, arranger and educator. 60+ national acts and tours. Thousands of shows, jobbing dates and jazz casuals in the midwest. Bill has been a professional trombonist and arranger for more than 25 years. He has performed with a wide variety of notable artists including Frank Sinatra, Benny Goodman, John Denver, Cab Calloway, Frankie Laine. 2006-present Tenor Trombone for Norwegian Star, No rwegian Cruise Lines. 2005-2006- Tenor Trombone Player for the Enchantment of the Seas, Royal Caribbean Cruise Lines 1994-2005- Member, International Trombone Association 2004- Tenor Trombone Player for the Empress of the Seas, Royal Caribbean Cruise Lines. Graduated from Humboldt State University in 1998 with Music Degree. Performed in many groups and Big Bands including Vegas, Upful Livin', Kensington Garage, etc. John Aram was born in Nottingham, England in 1962. He studied at the Royal Academy of Music in London and after graduating worked freelance with many of Britain's leading orchestras including the City of Birmingham Symphony, East of England and Northern Ballet orchestra. Paul currently performs as a freelance trombonist in the Philadelphia area. He specializes as a "jack-of-all-trombones", being equally as comfortable with high range tenor trombone as the bass trombone. Paul makes frequent use of the ancient ancestor of the trombone, the sackbutt, and also doubles on tuba. 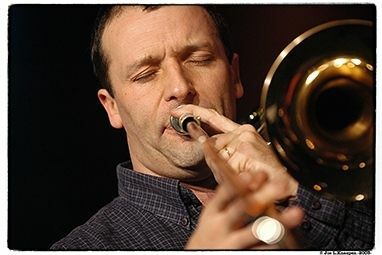 Roger Argente was born in Neath, South Wales in 1962 and started playing the trombone at the age of 12. A graduate of the Royal Northern College of Music, Manchester, Roger studied with Professors Terry Nagle and Neville Roberts and was a joint recipient of the prestigious concerto prize. B.M., Duquesne University; M.M., Northwestern University. Studied with Frank Crisafulli and Robert Hamrick. Has performed with Chicago, Pittsburgh, Baltimore and National symphony orchestras. Has appeared as soloist with the United States Navy Band and the Fairfax Symphony. A twenty-year veteran of New York city's music scene, Phil has performed as a jazz soloist with many legendary artists, including Dizzy Gillespie, Woody Shaw, Clark Terry, Bobby Shew, Richie Cole and his "Alto Madness Orchestra", the Gil Evans Orchestra, and Tito Puente..
Jonathan Arons has been dancing since age five. He watched Dance Fever on Saturday Nights, then showed his parents what he learned, improvising from that earliest time. Between ages seven and fifteen, he earned two black belts in different forms of karate, the youngest black belt in the history of his dojo. Jay Ashby is emerging as one of the bright new soloist, producers and arrangers in the jazz field. After spending many years in the musical "proving grounds" of New York, Ashby now divides his time between "The City" and Pittsburgh where he has a home with his wife and three boys. Tom Ashworth joined the faculty of the University of Minnesota in 1990. As the Professor of Trombone and Euphonium, his teaching studio includes undergraduate, masters and doctoral students. Born in Leiria in 1969, Hugo Assunção began his musical studies with his father and started playing the trombone in a local wind band - Sociedade Filarmónica Vestiariense (Vestiaria-Alcobaça). He continued his studies in the National Conservatorium with Emídio Coutinho. Bass trombonist Brandt Attema has been committed to the Radio Philharmonic Orchestra of the Netherlands since 1999. Trombonist Haim Avitsur premiered almost 60 new pieces for trombone solo, chamber music, and orchestra. He has worked with composers such as Joan Tower, and Leo Kraft as well as with composer's organizations such as the New York Composers Circle.